If each edge of an equilateral triangle in one of two colours, there are four different ways it can be done, with reflections and rotations considered different. If three colours are used, 11 triangles can be made, and if four are used, they form the set of 24 triangles pictured below. The entire border of the shape has only one colour. One of the greatest investigators into the triangles is Wade E. Philpott, whose puzzles and solutions were published in Martin Gardner�s Mathematical Games column and later in his book, Mathematical Magic Show. The number of ways in which the triangles can be fitted into a regular hexagon is not known. Six solutions are found, each with three smaller hexagons that have one colour each within it. The number of ways the triangles can be fitted into a parallelogram with dimensions 3x4 is also not known, but Philpott believes it is less than that of the hexagon. Again, six solutions are found, each also having three smaller hexagons of one colour each within it. Only shapes with perimeters of length 12, 14 and 16 can be made with the triangles. The hexagon is the only shape of perimeter 12, but the parallelogram is one of 18 symmetrical shapes found by Philpott that have a perimeter of 14 and are solvable with the triangles. All 18 shapes are shown below. Philpott also found 42 symmetrical shapes with a perimeter of 16. 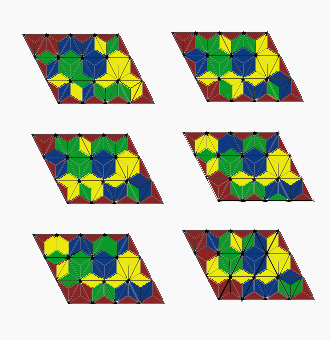 He also invented many other puzzles, such as the "duplication problem", which is to form two identical symmetrical shapes that meet the two conditions set by MacMahon and with borders of different colours. There are 28 shapes known to be solvable. The "triplication problem" is similar, but three shapes have to be made instead of two. It has been proved that only ten symmetrical shapes are solvable. These are shown below, with a solution for one of them. Manufactured sets have been marketed many times under different names by different companies, including Just Games, Ltd., and Parker Brothers. Similar games include those with the triangle coloured at their corners instead of their edges, and the 30 cubes and 24 squares mentioned earlier.